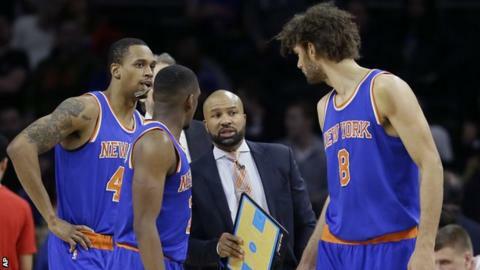 The New York Knicks have sacked head coach Derek Fisher after losing five matches in a row. The NBA's most valuable franchise - worth an estimated £2.07bn - are 12th in the Eastern Conference, five games adrift of the final play-off spot. Associate head coach Kurt Rambis has been put in temporary charge. "It's a lot easier to fire a coach than 15 players. Unfortunately, it's not always the coach's fault," said Knicks president Phil Jackson. "But we want this team to be competitive. It's time for us to make a change and turn this team around." Fisher, 41, won the NBA five times as a player with the Los Angeles Lakers. He took charge of the Knicks - his first job in coaching - in June 2014. Rambis, 57, was hired by the Knicks in 2014. An NBA coach for 18 years, his previous top-level job was with the Minnesota Timberwolves in 2011.